I shot this image during a walk along the Hike & Bike Trail near Lake Wichita Park a couple of weeks ago. It was a beautiful day, a little cool, with a hazy sky that brought out the bright colors in the foliage without casting a lot of contrasty shadows. I like this image for several reasons. 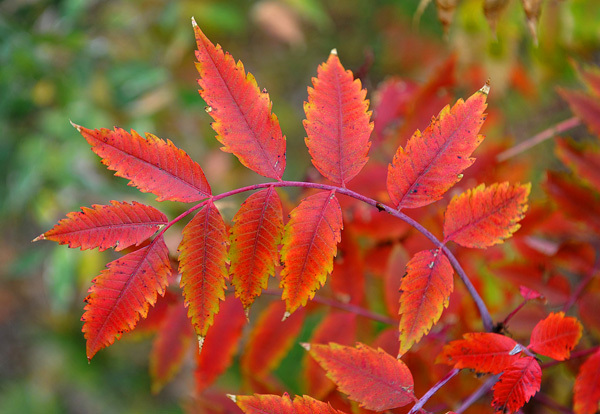 Mostly because of the intense reds and oranges but also for the gradations of different colors along the edges of each leaf. I shot it using a wide aperture which rendered a shallow depth of field for a soft, out-of-focus background. The greens in the background compliment the red tones in the leaves nicely. The arc of the plant stem is a graceful curve and creates a path for your eye to follow in the composition. The passage of time has always intrigued me. Sometimes it’s the blink of an eye, like the 1/500th of second shutter speed setting on my camera. And in that fraction of a second, a scene many, many decades in the making can be captured for future generations yet to come. Other times it may be how slowly the minutes or hours seem to pass when you’re anticipating something good is about to happen. Recently, I managed to find myself in Antelope, Texas of all places, thanks to a tip from a fellow photog friend of mine. The town site of Antelope, according to its historical marker, was platted in 1875 and at one time, had about 400 residents. There are just a handful of folks living in the area now. 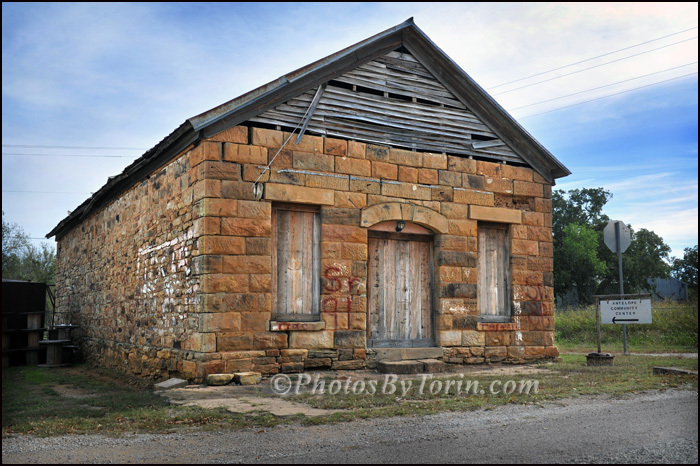 Now 1875 seems like a very long time ago, until I stop to think about the sandstone blocks used in building two of the more significant structures in town. The millions of years that passed from the time they were formed in the earth, to the day they were quarried for construction is hard to imagine. The Antelope Community Center is still standing on the main road through town, although it has been closed for several years and is showing a lot of deterioration. The other is the old high school gymnasium. What a cool building. It was constructed as a Work Projects Administration or WPA enterprise in 1938 according to the plaque by the front doors. 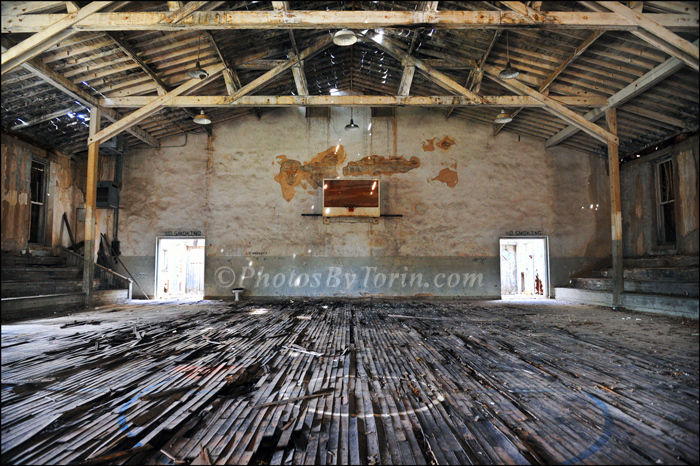 Inside, the orange metal goals are still fastened to the backboards but, the wooden floor of the basketball court has warped and buckled and rotted. The roof overhead, though supported by large, sturdy trusses, is slowly allowing the sun and the occasional rain to come through. Everywhere you look, you feel like you’ve been transported back in time thanks to the architecture, wooden bleachers, light fixtures and the lettering on the wall reminding everyone that only gym shoes are allowed on the court surface. If you stand still and let the quiet come, it’s pretty easy to hear the echoes of a basketball thumping, sneakers squeaking and a ref’s whistle from so many yesterdays, so long ago. Well, Teri and I took a little road trip down to Marble Falls, TX last weekend and had a really good time reconnecting with some old friends of ours. The area is very pretty and has a number of antique shops and second hand stores. We were wandering around looking at a lot of old things and found several salvaged doors, gates and pieces of wrought iron behind one of the shops. We all agreed they were pretty cool looking and I knew immediately I would be making a photo or two. Doors are kinda my thing. Now, I realize I’m not the first photographer to focus on doors as a subject, but I have quite a collection in my files. 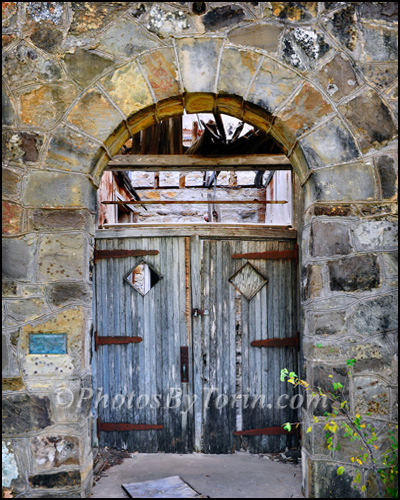 I include old windows and refer to them collectively as “Portals”. You can see more of them under the Art Photography tab on this website. Anyway, I came away with several satisfying shots and will include 2 or 3 of them in my next exhibit, I’m sure. 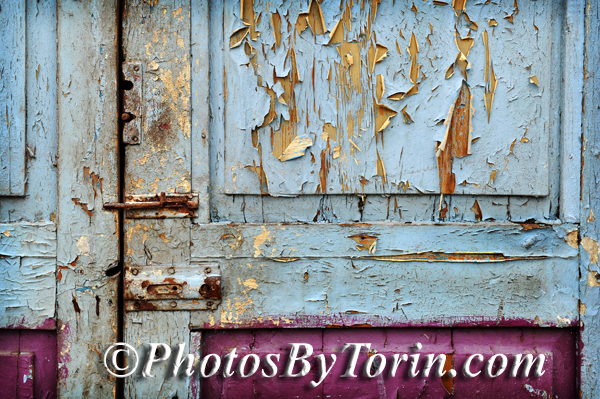 This photo is a detail shot of a section of the doors that include a couple of rusty old latches. I love the character in the light blue paint and how it splits and cracks in so many directions. Then, there is the odd purple color on the lower panels and the first grader technique used that doesn’t quite stay within the lines. I used a Nikon D3s with a 24-70mm lens around 55 mm at f 5.6. This is a photograph I took just last week during a short trip to New York. It’s my favorite recent photo, of a barn at an apple orchard in upstate New York. The place is Beak & Skiff Apple Orchard and my daughter and I and some friends visited as the beginning of apple picking season was just kicking off. The orchard is is more than a century old and is beautiful, with large sweeping vistas of the surrounding hillsides and the facility has been recently renovated, updated and expanded into a fantastic place. Part of the renovations include a new apple barn and that’s what caught my eye. 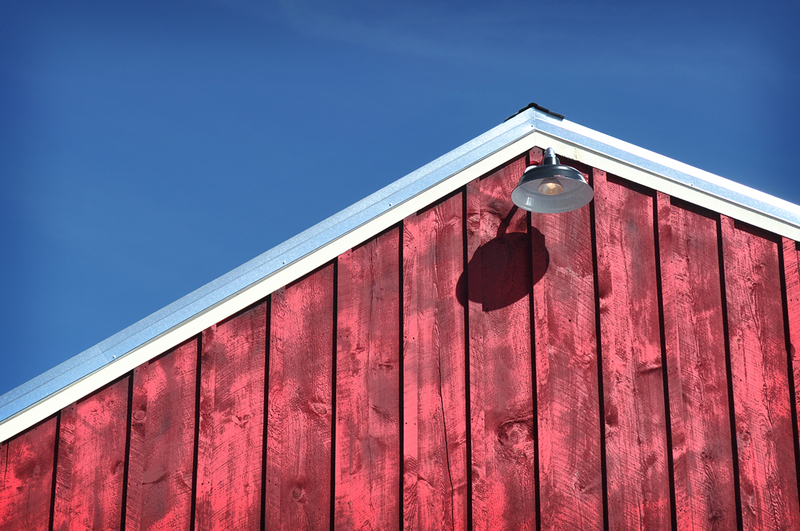 The construction is new, but with a time-honored style of board & batten walls painted the traditional ‘barn red’. Couple that with a rich blue sky, courtesy of a gorgeous day, and the simple geometric angles, and I couldn’t pass up the photo op. Using the vintage style light fixture as a focal point, I placed it in the upper right third of my composition. I shot it with my 24-70mm lens zoomed in all the way to crop out a few distracting elements and to simplify the look. We had a really great day picking and eating fresh, juicy apples. We bought a few souvenirs and thoroughly enjoyed spending a fun afternoon with people we care about. Truly a day I will remember for a very long time. 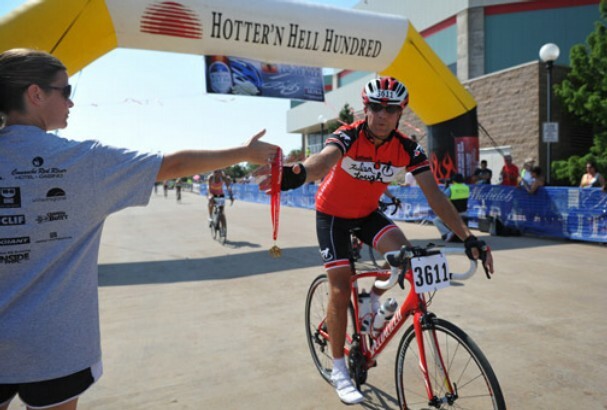 Every August as the Hotter ‘N Hell Hundred weekend draws near, I look forward to it with both anticipation and a fair share of nervousness. I get excited for all of the hundreds of great photo ops I’ll see and I get a little nervous for having the responsibility of being the Chief Photographer for the Times Record News and bringing back some key images for our coverage. It is the largest event we cover every year. Either way, it makes for a very long day. Our photo coverage usually begins on Wednesday as HHH personnel and vendors begin getting the MPEC Exhibit Hall ready for about 15,000 cyclists and their friends to pickup registration packets and shop for every type of cycling/fitness piece of apparel, equipment or accessory at the HHH Consumer Show. Then on Thursday, the early birds begin to arrive like the Swallows returning to Capistrano. The trade show opens and most of the more than 60 tents associated with the HHH are erected. Friday, the pace accelerates with the grueling off-road mountain bike races and blistering criterium races. I usually have most of my ducks in a row, having printed out maps of the routes, gone over photo responsibilities with other photographers and reporters and have positioned the big boom lift for the Mass Start the next morning. I never seem to get to bed any earlier the night before, even though I’ll be getting up about 4:45 in the morning to be downtown at 5:30. Saturday arrives, I drag myself out of bed, get ready and get a decent parking spot by 5:32. As I get all my gear together, there’s a rider parked next to me, putting on his skintight cycling jersey made of Spandex or Lycra or some other high-tech moisture-wicking fabric. I comment that it seems weird to be slathering on sunscreen in the dark at 5:30 a.m., but I might not get a chance to later as the day moves forward. 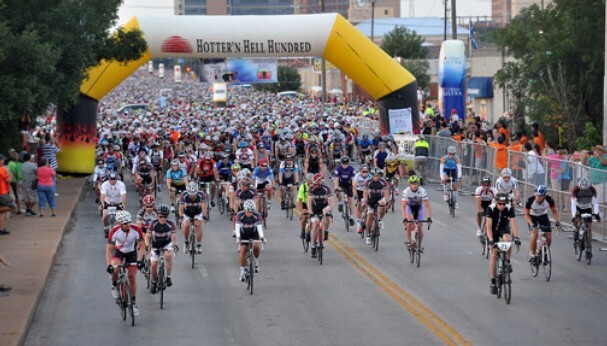 The sky gradually gets lighter and the anticipation builds for the upcoming National Anthem, flyover and cannon blast which signals the start of the 32nd Hotter ‘N Hell Hundred endurance ride. Approximately 12,000 riders begin streaming toward me as I perch in the basket of the cherry picker about 20 feet above Scott Street. I’m shooting as fast as I can, using a variety of exposures, focal lengths, lenses and compositions. I also shoot some video for the website and a quick frame or two with my phone that will be Tweeted and posted to Facebook within moments. After several minutes, I’ve gotten just about every combination the situation will allow and I come down to work the scene at ground level. It’s always a thrill to see the sheer mass of humanity that rides in this event. It’s the largest 100-mile ride in the entire country. It’s impressive, watching thousands of cyclists of every shape, size, skill level – riding bikes of every size, shape and type. It’s very uniform, yet incredibly diverse. They’re all doing the same thing, just a few thousand different ways. It’s SO many people, yet it’s so quiet, with just some light conversation and the whirr of the bike chains. I work my way toward the back of the pack which actually takes about thirty minutes and head to my car. I drive over to Iowa Park and shoot riders splitting off as they choose the 100K route or the less-serious 50-mile route. The rest stop features Powerade being mixed in large trash cans and they’ll go through about 120 gallons of it, not including the water and pickle juice options. Back in my car, I head north to Burkburnett, stopping for a few minutes to shoot riders silhouetted by the sun. In Burk, I shoot a few shots from near ground level of serious cyclists blazing around a corner and like what I see on my camera. On the way back to town, I remember that a big part of the ride is where a couple of the routes go through Sheppard Air Force Base and hundreds of airmen turn out to cheer the riders on as they begin the last legs of their rides. All their clapping and cheering must be a big boost for the tired cyclists. Very cool. Back downtown, I trek over to Finish Line Village where all of the action is. The sun is much higher now and it’s getting HOT. It’s not bad, though, because of all the excitement in the air. A big inflatable arch marks the finish line with announcers keeping a running account of interesting HHH facts and encouraging riders barely able to make it to the finish. There’s also live music, lots of energetic vendors with energy bars, energy drinks, energy supplements and tips on how to have more energy. Some more serious riders come breezing across the finish line having ridden the 100 miles like it was a trip down to the corner store and back. And then there are others. Some are near tears, exhausted, bruised, scraped, dehydrated and delirious from too much time on a tiny bike seat and too little time spent preparing for that many miles. A lot of fun photo opportunities. After a few hours, it’s time to get to my office at the newspaper and begin the task of culling and editing the hundreds of images I’ve shot in the last several hours. I’ll also go through photos taken by reporters and freelance photographers, to build a comprehensive collection of images for our online product and for the next day’s newspaper. The paper has a limited number of pages and therefore limited space for photography, but the website can hold everything we want to showcase. After several hours of editing, cropping, captioning and uploading (and several slices of pizza – thanks Boss) the day is done. It’s been about 14 hours and I’m ready to go home and enjoy a cold beverage or two. To see more, go to TimesRecordNews.com and follow us on social media: Facebook.com/timesrecordnews , on Twitter @TimesRecordNews and on Instagram @TimesRecordNews and search #HH100. 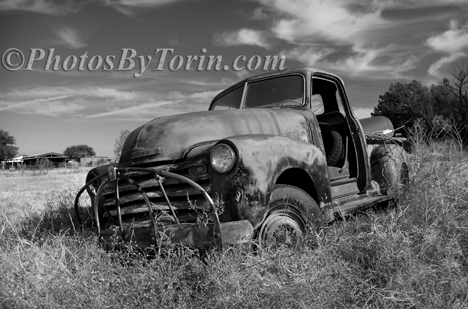 I came across this old pickup truck on pass through Seymour a couple of years ago. I love things that are old and decaying but still have a lot of character left, so I was kind of drawn to the old Chevy resting and rusting out in the field. I like to imagine what this pickup was like when it was brand new – when the owner first drove it home from the dealership. How proud he must have been. Then, as I walk around the hulk of decomposing iron, with weeds slowly taking over, I think how sad the owner might have been as it was driven one last time, or dragged out into the pasture, never to run again. This is one of my favorite recent photos, shot way back behind backstage at Memorial Auditorium several months ago. I had finished shooting a series of promotional photographs for the Wichita Falls Symphony Orchestra during a dress rehearsal. That in itself was a lot of fun because I got to roam in and around various musicians on stage, shooting interesting angles of instruments large and small while they played. So, it had been a good day already when I decided to poke around a little and play “I wonder what’s behind this door” and “hmmm, let’s see where this hallway leads”. Some of my favorite images are taken in places where the general public isn’t allowed to go. This was one of those places. It was so far backstage, I think it was only for utility workmen or maintenance staff . Notice the crude construction block and sloppy mortar work of the wall. And the floor looks rough and unfinished. The lighting is a bare light bulb hanging here and there. As I passed through, the red chair caught my eye and I had to take the photo. The elegant style of the chair is such a contrast to the surroundings with its smooth, bentwood frame and slightly contoured seat and back. 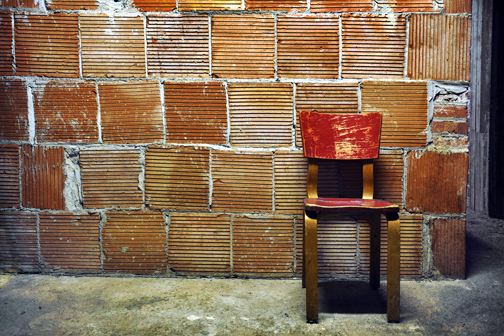 Yet the red paint, scratched and thin, harmonizes with the coarse environment just enough. Nikon D3s, 24-70mm @ 35mm, shutter 1/15th, ISO 2500, f-3.3.